And yet, we are afraid of having even our friends over. We stay closed off in our little houses, a city full of fortresses, afraid to share life with each other. Now maybe that is not as revolutionary for you as it is for me, but it shook me up. For you see, I have a hard time getting to know people. It takes a lot for someone to break through my shell. I frequently get described as ‘intimidating’. And I hate this about myself. No matter how hard I try to let others in, I have this inner switch that I can’t seem to figure out how to flip until I feel comfortable around someone. How does this keep me from showing hospitality to others? How does it hinder me from sharing life with them? Learning and benefitting from them, and vice versa? How does one make friends? How do you teach yourself to treat strangers as if you already knew them? I think our society is paralyzed by fear… we view all people we don’t know (especially if they are of a different race or socioeconomic status) with suspicion. We glance around nervously in poorly lit parking lots. We stay in our familiar side of town. We don’t initiate with strangers, and when strangers approach us, we focus on only how to disengage from conversation. This is not without good reason. Crime statistics are up. We hear over and over about how people are praying on the weak, the vulnerable, the foolish. But what is this doing to our ministry? How can we treat strangers as if we already knew them as a part of our daily existence? How can we resurrect the concept of Christian hospitality? Confession. I haven’t told anyone I have a blog. Why? Because I am afraid. I am afraid of what others think, that my thoughts aren’t complete enough, that my writing isn’t strong enough. But as I was thinking on this last night (selah) I realized that the reason I haven’t shared my blog is, at its core, because of my lack of hospitality. I am afraid it isn’t pretty enough for public consumption. I’m intimidated by my friends and family looking at the contents of my imagination. But if I am going to take seriously this echo, this call to practice Christian hospitality, don’t I need to share it? Isn’t this exactly what God is calling us to do? Be intentionally transparent with each other? Be vulnerable? 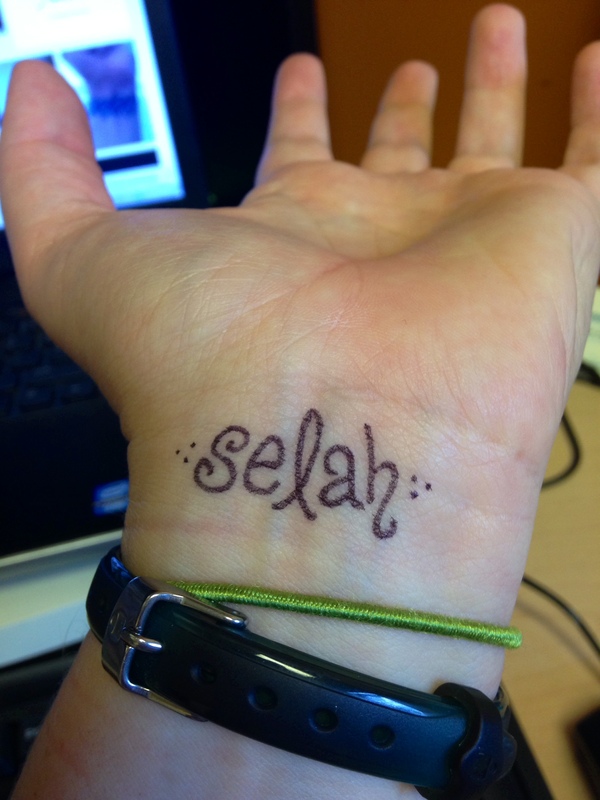 Allow my friends to see that I’m not really sure where to put a comma, and know that the concept of Selah is something that in equal parts attracts me and confuses me? I have been thinking a lot about hospitality lately. It was something that was pretty important in the Bible. And a concept whose meaning has become distorted and lost in today’s culture. When I think of hospitality these days, the first thing that comes to mind is pictures from Pinterest. Mason jars, burlap, candlesticks. Perfect houses serving pretty food. Bonus points if it is made from items from your own garden or contains quinoa. We are afraid to have people over in our homes, unless we have spent days cleaning. We are afraid to let people be at home in our lives because we can’t seem to rid ourselves of our pesky flaws. We think that we should be as perfect inside as we strive to be on the outside. The Bible calls us to practice hospitality. To entertain strangers in our home. And yet, we are afraid of having even our friends over. We stay closed off in our little houses, a city full of fortresses, afraid to share life with each other. Why? What does hospitality mean in today’s culture? How do we as Christians practice hospitality, koinonia community? How do we break that social more, the one that makes us afraid to open up our lives and hearts to one another? God calls us to be known. The book of Acts is about a community, a group of friends that become family. This is a vital ingredient in our Christian development. Yes. Of course it’s scary. Yes, it will be awkward, and heartbreaking, and annoying at times. But it’s vital. Well… I’m inviting my small group over for dinner tomorrow night. And I am not cleaning up before. And then we are having other people over on Friday. Once again, no clean up. No pinterest. No perfect. I am going on a walk with my friend tonight. And another friend Thursday. This little introvert is breaking out of her shell. Live each moment as if it were your last. Because it may well be. But what if said moment was your first? we lived a life of epic beginnings? we raced towards the sunrise? or grabbing lunch wrapped in foil? What if we lived a life filled with opportunities and not obligations? I would listen more, pray more, think more, laugh more. but as a divine moment. So I am not getting a tattoo. wikipedia= Selah (Hebrew: סֶלָה‎, also transliterated as selāh) is a word used 74 times in the Hebrew Bible – 71 times in the Psalms and three times in Habakkuk – and is a difficult concept to translate. It is probably either a liturgico-musical mark or an instruction on the reading of the text, something like “stop and listen.” Selah can also be used to indicate that there is to be a musical interlude at that point in the Psalm. The Amplified Bible translates selah as “pause, and think of that.” It can also be interpreted as a form of underlining in preparation for the next paragraph. Selah. Stop and listen. pause, and think of that. 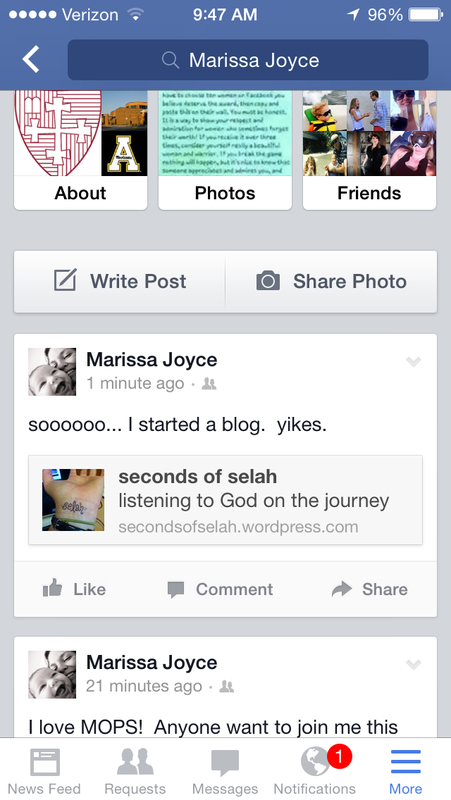 I need more selah in my life. I need to pause, to think, to listen, to marvel. I love that this term can also be used in music- I really think my life needs more musical interludes. What if we saw stoplights, long lines, unexpected delays not as sources of frustration or time wasted, but as the violin solos of our day? A chance to sit back and reflect, soak in the beauty of this life we are living? Do you ever just feel bowled over by the sense of God’s presence? From time to time I will see something, read something, hear something, taste something, and think this is important. Not because there is some practical application or monetary value that can be gained from it, but because moments like these are the fabric of life. Hearing my daughter laugh. Watching my son run. Eating a blackberry, straight from the bush. This is what is important. This is what I need to pay attention to. If we don’t embrace selah into the tempo of our lives, we will never give God space to speak. His lessons will whiz by, lost in the tumult of our hurry. Stop. And listen. That moment was important. Be present with this person. Enjoy this piece of music… this experience… this emotion. How do we learn to stop? What are we listening for? There are no answers to these questions, because these questions are the Big Ones, the ones we learn to answer over a lifetime. But start the journey with me… and hold me accountable to my quest. I do think this is a way that God speaks. Thoughts. Concepts. Words. Convictions. Things that repeat over and over in your life until you realize that these concepts are something you need to hear, need to implement, need to learn. Once you recognize an echo, it often becomes hard to ignore. God’s whispers turn to shouts. Yet how do you train your heart to listen? I don’t know exactly, but I hope that this blog is a part of my obedience to the process. Here is the place where I want to share my echoes, the scraps of wisdom I am picking up from God’s gracious hand as I live my life. It is an act of obedience, a choice to be vulnerable and share my words with the world, not something that comes easily to me.